Large complex at the tip of the North Greenwich peninsula. 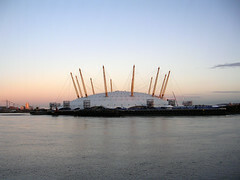 Previously known as the Millennium Dome, and now as "The O2". Should not be confused with the O2 Centre on Finchley Road. Last edited 2012-03-21 15:27:25 (version 6; diff). List all versions. Page last edited 2012-03-21 15:27:25 (version 6).